Most people dream on leaving their 9 to 5 job and have a business of their own. However, most them are discouraged by the tedious process to start a business, that is aside from the fact that it costs a lot of money and demands most of their time. But for those determined ones, they draw inspiration in the future success they gain when they finally open up their own business. But how do you start a business? Aside from the wads of cash you need to prepare, what are the other things you need to have in order to successfully open up a shop of your own? This research study will force you to come up with new ways to outgrow and outsmart your competition. Based on the research you have done before starting your business, you can compare and contrast effective strategies to apply to your own business. You can also come up with new strategies and techniques that will put you on top of your competitors. Your business plan will force you to develop new ways in order to keep the business going like new marketing and sale strategies. Having a physical representation of your plan will let you see the holes of your thinking before actually venturing out into the business world. This will give you enough time to decide what to do and not to do with your business. It will also give you a picture that can help you decide whether this idea is better than the other or if this one idea has too much loopholes to pursue. With your business plan, you get to synthesize a common vision or goal for your whole team. You get to decide and nurture one goal for the business with everyone’s opinions in mind. You also get to unify your whole team in focusing and achieving a core vision for the business which will then result to better teamwork and service. Aside from all the other aspects a business plan is needed, it also a common prerequisite for applying for financial funding. Some banks or investment sectors require you to have a concrete plan for the business before lending you a certain amount of money. It is quite common for them to ask for a business plan so that they can get assurance for you to pay the loan and its interests. If the business you want to start is a freelance business, you may not need to create a business plan. However, if you plan to start a business that will require a significant amount of time, money and resources, it is quite necessary to have a business plan. If you’re serious about starting a business of your own, carefully and seriously planning the business is critical for you. You may also see How a Business Plan Can Help Small Business Owners? A business actively looking for funding through a loan, investor or partners needs a business plan. A business plan is your key to convincing investors you are worth the risk of investment. Business planning is more aimed at startups since they are the least experienced in the industry, they need the guidance of a concrete plan. However, it is wrong to think that a business plan is only for businesses actively looking for financial help, even business owners appreciate a plan in its existence be it for financing or trying to invest in surplus. Established business still look for investors even at the middle of their operations. However, the amounts they seek are much bigger since they use it mostly for expansion. They use the business plan to strategize and plot their plan for growth and development. A plan also helps manage the rapidly growing business and and introduces the company’s expansion goals to its costumers, suppliers and other stakeholders. As this is the part that highlights the points you’ve made in the business plan, it is advised that you write this last. It is basically a page or two summary that serves a a doorway to your plan. Summarize the problem, state your solution, state the target market, founding team, and financial forecast highlights. Keep things as compact but brief and aim to convince your audience to learn more about your company. State and describe the problem you aim to solve and the solution that you are selling. Rather than thinking about the benefits that the company can bring to you, think about your costumers’ needs and how they can benefit from you. In most cases, this is where you describe the products and services you are trying to sell alongside the graphs and tables that provide more details like bill of materials or detailed price lists. You need to know and identify your target market and how it is changing. You also need to identify your competitors, and answer why there’s room for you in the industry. You need to identify the types of costumers you aim to serve. Use this section to discuss the costumers’ needs, where they are, how to reach them and how to deliver your product to them. 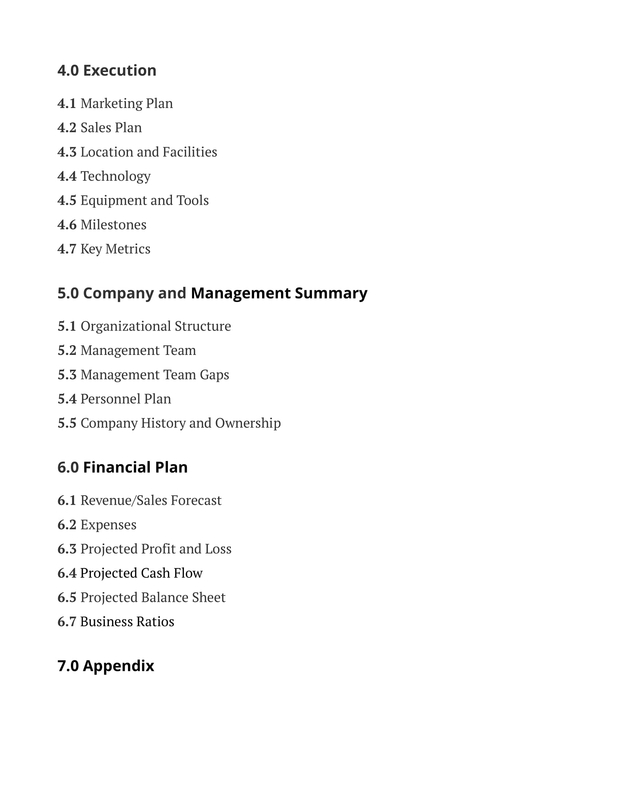 This is the section where you outline your marketing plan, sales plan, and the other logistics involved in actually running your business. Other things you will want to discuss are the technologies you plan to use in your business, your location, and other facilities. You also need to discuss the road map in getting your business up and running. Finally, you’ll want to outline the standards you’ll be tracking to your business to make sure its headed in the right direction. This section is where you describe the organization of your business, the key members of the management team, and a brief history of your company. This section serves as an overview of who you are. Be sure to include a mini resume of your managers– their background and experiences. Full-length CVs should also be attached to the plan. This section should include your projected profit and loss, cash flow tables, and a brief description of the assumptions you’re making with your projections. You can also attach your balance sheet, sales forecast, business ratios, and a break-even analysis. Highlighting the money you need to launch your business is also important when you are still looking for funding. Tailor you plan according to your audience. For example, your business plan should highlight the proposed return of investment when presenting the business plan to an investor. You should undertake thorough market research and ensure that the plan references the market size, its predicted growth path and how they will gain access to this market. As an integral component of understanding your own business, you should also understand the nature of your competition and the bases for competition in the industry. Ask yourself if you can effectively compete with the existing players in the industry. Your plan should be concise however it should still include the details to ensure that readers have the information to understand your business. Pay close attention in how you present your business as it can affect your audience’s perception about it. It is important to clearly describe the investment opportunity if you are seeking investment in your business. What make your business a good investment for your prospective investor? What makes you unique from everyone else in the industry? Important areas which will let your audience clearly understand your business should not be forsaken. Include sections on the company, product and/or services, market, competition, management team, marketing, operations and financials. Select someone detached from the project to review and constructively criticize you business plan. In this way, you get an objective point of view about your plans. Your plan should be constantly reviewed and updated as it serves as a guideline for the responsibilities and deadlines of your business. An effective business plan will ensure that the business stays focused on the goals your have set to achieve. Overall, a business plan serves as a guide for the business during its starting phase and also during its activity. It helps set goals that the business needs to accomplish in order to successfully merge in to the real world. A well-planned and well-thought out business plan makes all the difference, you have to be keen on the details you wish to include in your plan.